Monday 10thSeptember sees wine judges head to Dorset’s Langham Wine Estate for the 2018 South West Vineyards Association (SWVA) competition. 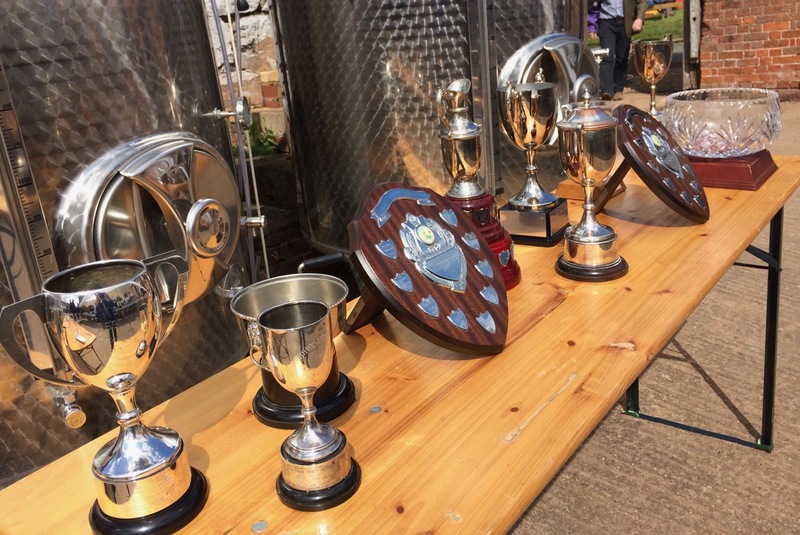 The annual awards, founded some forty years ago, provide an exciting opportunity for SWVA members’ distinctive wines to be tasted by an expert judging panel consisting of Masters of Wine and wine trade professionals, with the results to be announced the following day. The 2018 competition, judged to international standards, sees 95 entries from 28 artisan producers across the South West counties including Cornwall, Devon, Somerset, Dorset, Bristol, and Gloucestershire. On the panel this year are wine experts Patricia Stefanowicz MW, Lindsay Oram, Richard Coulson, Jemma Mitchell and, new to the SWVA line up, Alex Taylor. The South West Vineyards Association (SWVA) is one of seven regional associations covering the wine growing areas of England and Wales. It covers the Isles of Scilly, Channel Islands, Cornwall, Devon, Somerset, Dorset, Bristol, Bath, Gloucestershire, Worcestershire, Herefordshire and Shropshire. We share some Monmouthshire members with the Welsh Vineyards Association and some Dorset members with the Wessex Vineyard Association. All of the regional associations share a national parent body, "Wines of Great Britain" (WineGB). Founded in the 1970s in by the late Gillian Pearkes, Devon-based English vinegrowing pioneer, the SWVA spread outwards from Devon to become geographically the biggest of the regions with the largest number of members and now has a membership of around 80. West Country vineyards are typically smaller than the large commercial vineyards of the SE, mostly family-owned-and-run. Many are open for visiting. Expect to find authentic, individual, terroir-driven wines, passionate, hands-on producers and beautiful, rural, sometimes quirky, usually informal wine tourism destinations. The standard of wines is generally high. Many are of international-award-winning quality and some producers are world-class trophy-winners. The Langham vineyard was originally established by John Langham on a very small scale. In 2009 John’s son, Justin Langham, decided to develop his father’s rudimental vineyard into a commercial venture, and planted 30 acres of land at their Crawthorne farm. With a south-facing aspect, chalk soils and a unique microclimate, Crawthorne vineyard provides the perfect terroir for ripening the classic Champagne varieties – Chardonnay, Pinot noir and Pinot meunier. Established hedgerows provide natural wind breaks and habitat for a large variety of beneficial organisms. Growing their own grapes means they can pick at optimum ripeness, free from the shackles of contract purchasing and resulting in a better quality wine. The Langham Wine Estate tasting room and Vineyard Café is open 10pm-4pm, Wednesday to Sunday through until end of September and Tuesday to Saturday from October2nd . Visit www.langhamwine.co.uk for directions and full opening times. 31st July saw the second of the new self help meetings for West Country winegrowers instigated by Chair, Guy Smith. This second meeting was at Wraxall Vineyard near Shepton Mallet in Somerset. 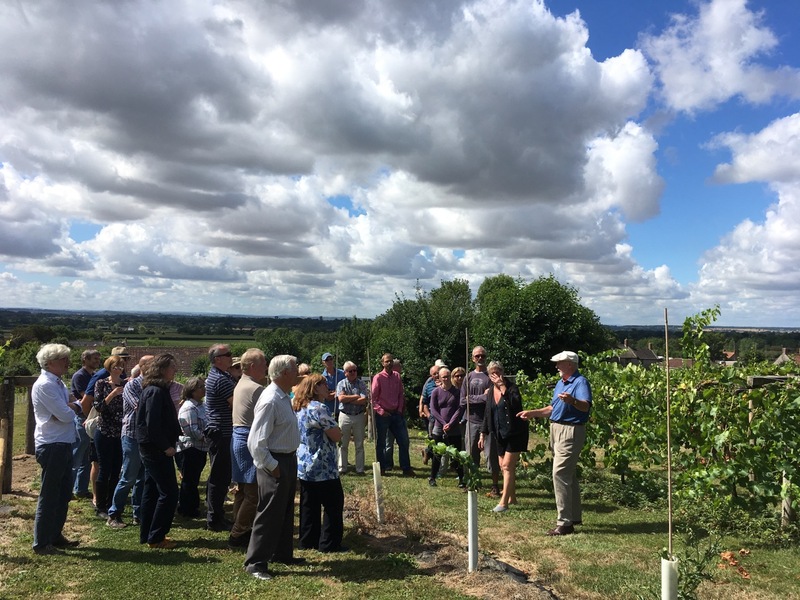 It was well attended with over 30 of the region’s vinegrowers together with visitors from the Wessex Vineyards Association. Discussion, at this crucial stage of a promising vintage, was of leaf-canopy management and disease and pest management, especially of how to deal with unwelcome newcomer, the Spotted Wing Drosophila, drosophila suzukii. This new fruit fly, originally from Japan, has spread rapidly across the country. It lays its eggs in unripe fruit, potentially spoiling an otherwise healthy crop of any soft fruit. Scary! 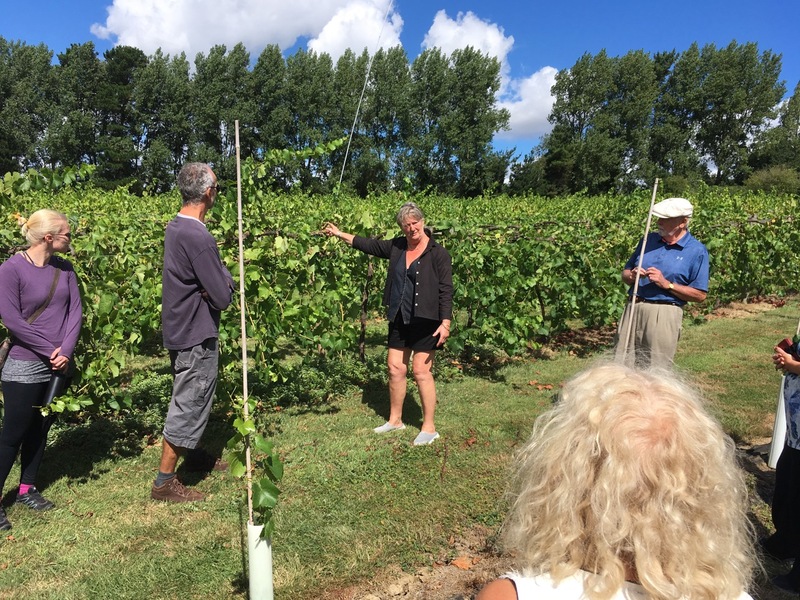 Wraxall Vineyard is one of the Region’s oldest, brought to life again by current owners Jacky Brayton and Brian Shirley after a fallow period. It is trained on Geneva Double Curtain (GDC) trellis. Brian talked about the pros and cons of the high-level, divided GDC training. The original vineyard had been GDC, and because of a large badger sett on neighbouring woodland, Brian and Jacky have continued with it for their extensive new plantings, partly to keep the grapes high up out of badger reach. Members carried on chatting animatedly over a simple but delicious salad lunch that Jacky and Brian provided and that everyone chipped in for. We were delighted to hear that WVA are copying these informal vineyard meetings. SWVA members are invited to their first, at Raimes Sparkling on 6 September. 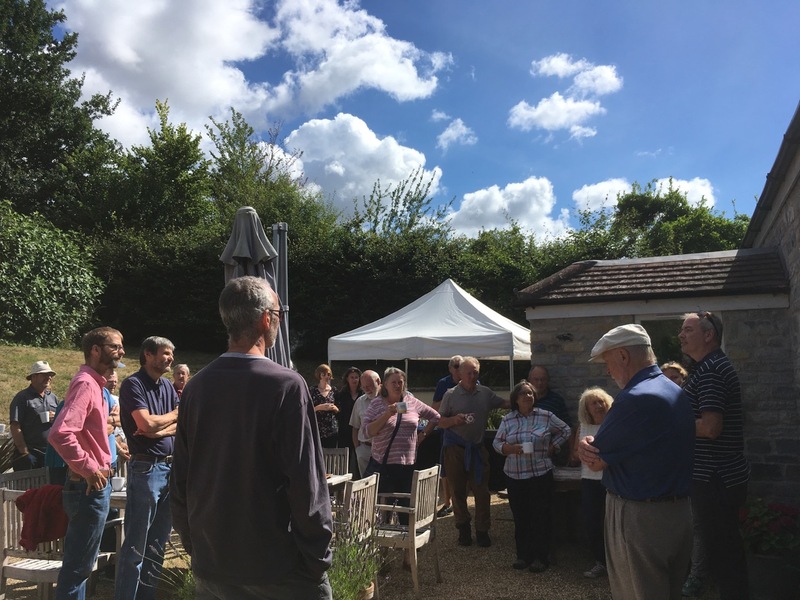 The Region's first SWVA Waffle and Walk meeting was on 9th May at Guy Smith's own vineyard, Smith&Evans, at Aller, on a south facing slope with stunning views overlooking the Somerset levels, pictured below. Over 30 attendees included visitors from neighbouring Wessex VA including WineGB Chair Simon Robinson and WVA Chair Tim Ingram Hill. 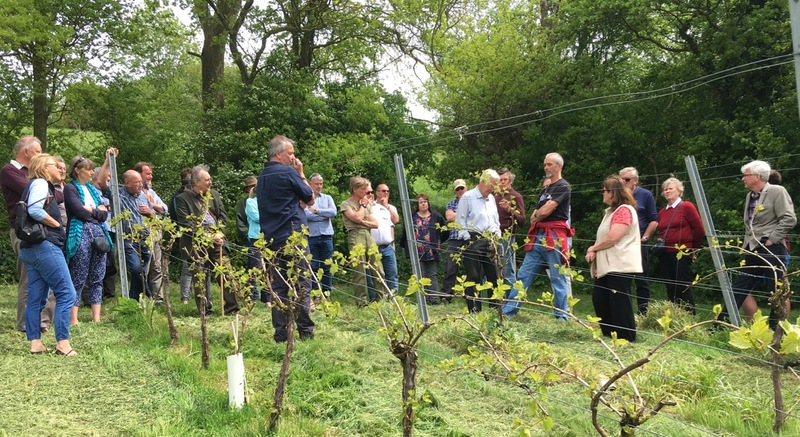 After introductions and a walk up to the highest point of the vineyard, discussion focused on vigour management, training systems, shoot selection and small vineyard management. Members, as at Wraxall, carried on chatting enthusiastically over lunch swapping experiences and tips. 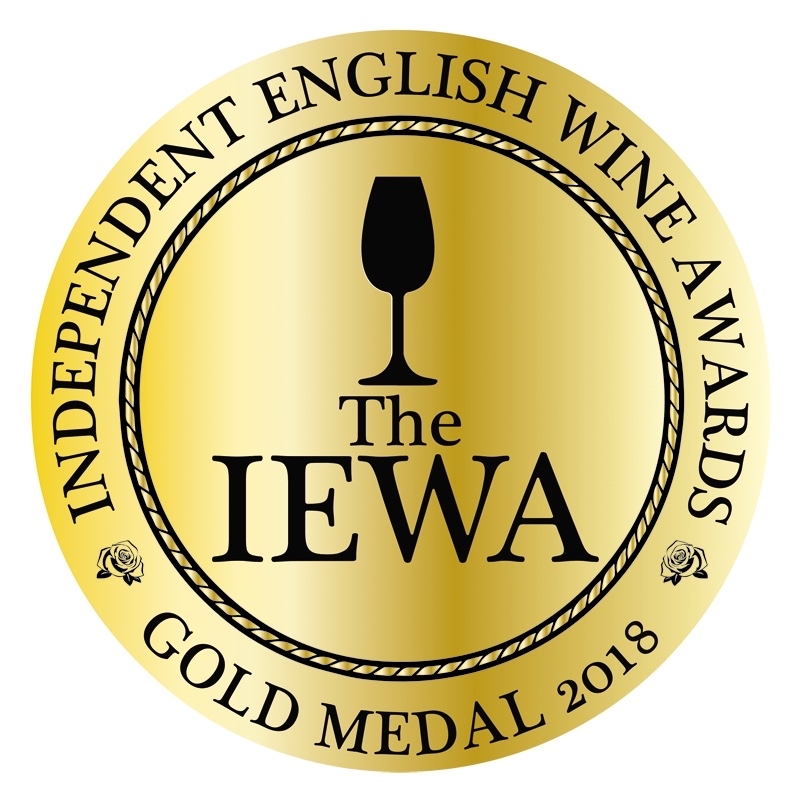 (The IEWA), which held its second annual judging at the historic Rummer Hotel, Bristol on 17 March 2018. In the second year of this Competition it attracted 88 entries from 22 different counties, a rise on its first year. The competition awarded 72 medals, up from last year's 54: 13 gold, 28 silver and 31 bronze, with winners a near even split between sparkling and still wines. The title of top sparkling wine of the competition was awarded to Dorset's Langham Estate's 2014 Sparkling Rosé. Other Golds for SWVA members were Lyme Bay Winery's red Pinot Noir 2016 and Worcestershire's Astley Vineyard Sparkling Kerner 2014. SWVA member Silver Medals went to three 2016 Bacchus wines, from Polgoon, Aldwick Court Farm and Astley, two sparklers from Lyme Bay, their Blanc de Noirs 2014 and Classic Cuvée 2013 and also their 2017 Bacchus, to Langham's Blanc de Noirs 2013, Three Choirs Classic Cuvée NV and Dunleavy's still Pinot Noir Rosé 2016. SWVA Bronzes were: Three Choirs Siegerrebe 2016, Astley Old Vine Kerner 2015, Langham's Classic Cuvée 2014, Lyme Bay Chardonnay 2016, Fenny Castle Blanc de Noirs 2015, Polgoon Rondo 2016, Oatley Leonora's 2014, Dalwood Brut 2015, Oatley Barrel Matured 2016, Three Choirs Coleridge Hill 2016. The 18-person judging panel was chaired by Master of Wine Liam Steevenson, and sub-chaired by winemaker Ben Hulland, Champagne buyer Alex Schuster and drinks writer Cherry Constable, with panel members drawn from across the wine spectrum, from merchant, to broadcaster, to knowledgeable consumer. Judging was carried out by blind tasting, with scoring submitted via a digital platform, with gold medals then tasted again by the panel chairs to verify results and establish ‘trophy’ wines for both sparkling and still. Chair of Judges: "Lyme Bay Red: Pinot Noir that the Burgundians would be proud of"
Founder: "So much to celebrate.."
Event founder, Bristol-based marketer Alexander Taylor commented: “These results really show off the diverse capability of English wine. They show that we’re making compelling wine all over the country, still and sparkling, using a range of grapes and styles - a fantastically broad offering to consumers; Cornwall to Hampshire, Staffordshire to Sussex - medal winning wine is being made all across England. There is such a wide range of styles to choose from. English wine now means genuinely different still and sparkling wines, from our take on international styles, from Classic Cuvées, Blanc de Noirs, Pinots Gris, Blanc and now even Noir (! ), to lesser known Ortega, Seyval, and Kerner, and of course our own emergent still wine messiah, Bacchus. There is so much to celebrate in English wine right now - and the results of the IEWA this year simply reflect that. It’s a real privilege to be able to work with producers to help grab people's attention and tell the story" Taylor said. 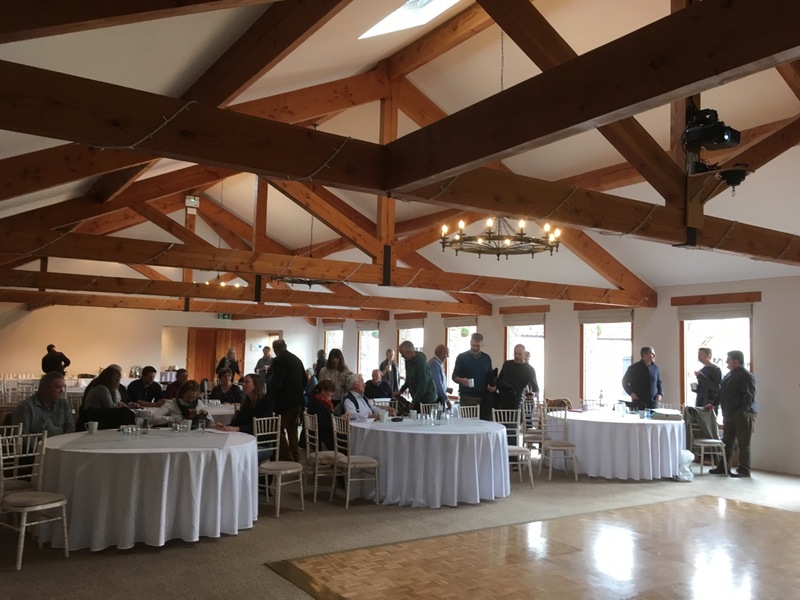 English wine growers from across the West Country gathered at Aldwick Court Farm and Vineyard on Wednesday 14th March for the South West Vineyards Association Spring Meeting and AGM 2018. Many thanks to Sandy Luck, General Manager and Elizabeth Laver, Vineyard Manager, for their warm hospitality. Sandy is now the Vice Chair of SWVA. This was Guy Smith’s first full meeting as Chair. Guy runs a small vineyard, Smith & Evans with his partner Laura Evans at Aller, Somerset, specialising in English sparkling wine from traditional Champagne varieties. In his day job he works in the wine trade internationally. 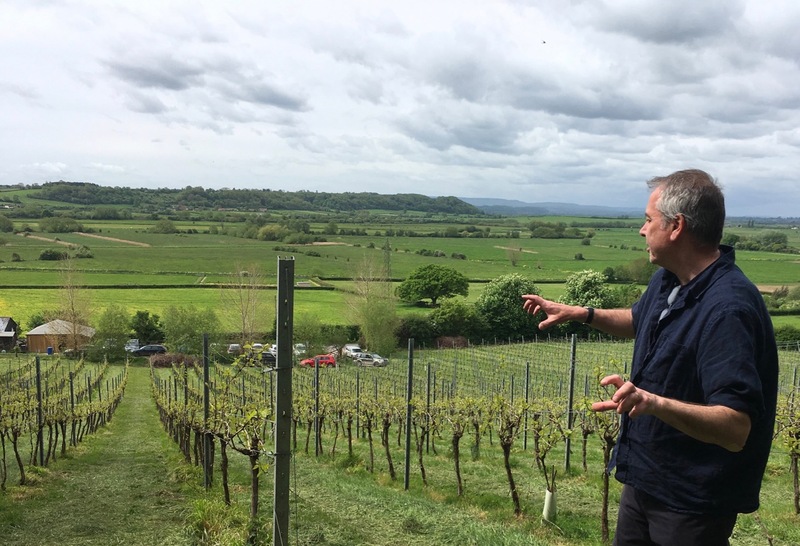 Guy’s Chairman’s Report set out his vision for taking the SWVA forward in the context of a burgeoning English Wine Industry. We should position ourselves as what we are, mostly small, family-owned-and-run vineyards producing interesting, authentic, different wines. 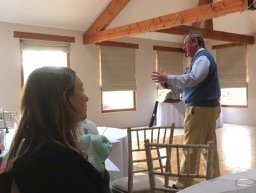 The first guest speaker was David Parkinson, new Chief Executive of the SWVA’s national parent body, “Wines of Great Britain” (“WineGB”). WineGB is newly-formed, the result of a merger between the former parent body, the UK Vineyards Association, with English Wine Producers, the marketing organisation of the larger English wine producers. David (photo left) emphasised the speed at which the industry is growing. A million vines were planted in England and Wales last year and this year could top two million. He outlined the work strands that are going on in the new organisation, many of them involving working groups of regional members, including SWVA members. He will be working with the SWVA in approaching local authorities and tourism bodies to ensure they are fully aware of the potential for tourism and economic development being created by our West Country wine producers. 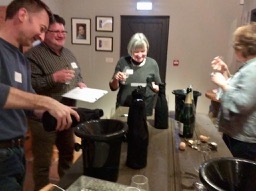 organised a sparkling wine blind tasting in Aldwick's tasting room (photo right). Members blind-tasted a Cava, a Prosecco, a supermarket English Sparkling Wine and three levels of supermarket Champagne: entry level, branded and own-brand vintage. The most-favoured was actually the vintage champagne, a 2009 vintage from Tesco. Only one member identified all correctly (take a bow, Simon Day!). Robin Snowdon, of Limeburn Hill Biodynamic Vineyard, near Dundry, Bristol, gave an excellent presentation on biodynamic viticulture and winemaking. Limeburn Hill is one of a handful of biodynamic vineyards in Britain and has just produced its first small vintage, all grown and made according to biodynamic principles. We are all looking forward to sampling their wines in due course to taste the difference. At the formal AGM, Caroline Gitsham, Head of Marketing for Langham Estate near Dorchester was welcomed to the committee. Caroline will be taking over from Guy in participating in WineGB's marketing working group. Faye Pratt, Alina Stankus and Alison Routh stood down. The South West Wine of the Year is ....a STICKY! 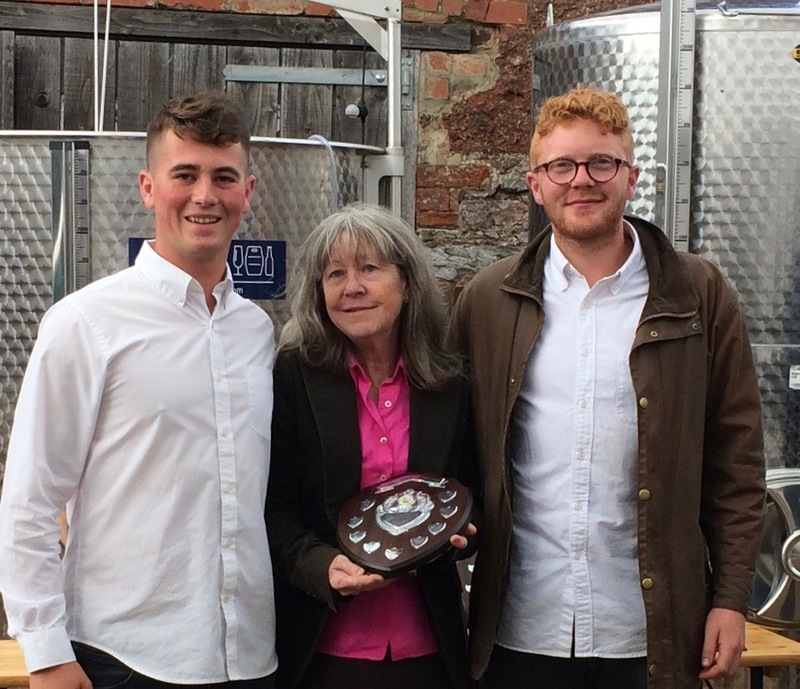 Gloucestershire's Three Choirs Vineyard wins the South West Wine of the Year with its dessert wine "Noble Harvest 2015". 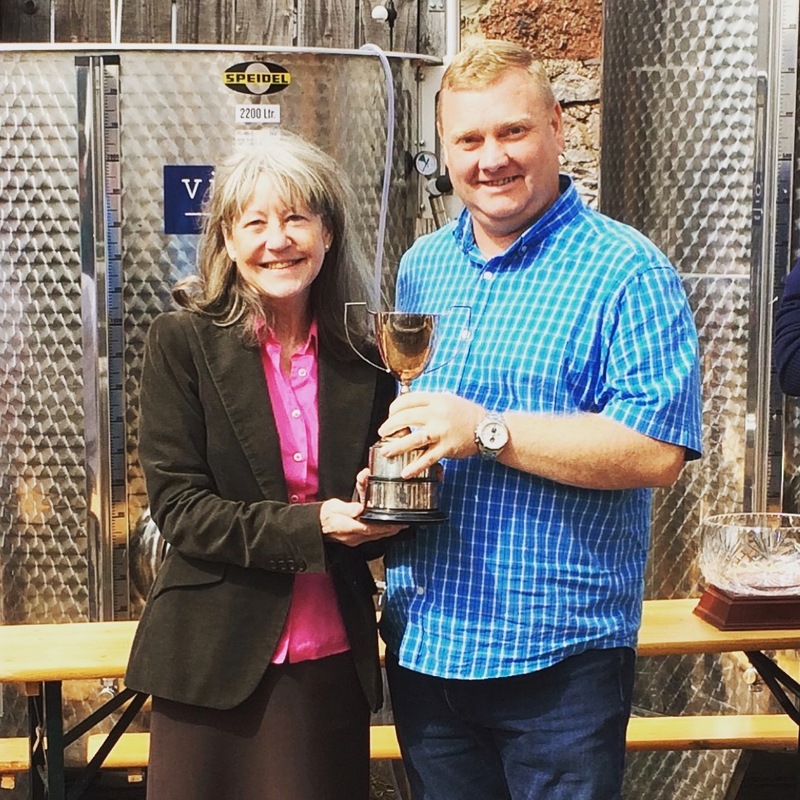 Pictured is winemaker Kevin Shayle from Three Choirs Vineyard, Newent, receiving the SWVA Wine of the Year 2017 trophy for the best wine in the annual competition from chief judge, Patricia Stefanowicz MW. 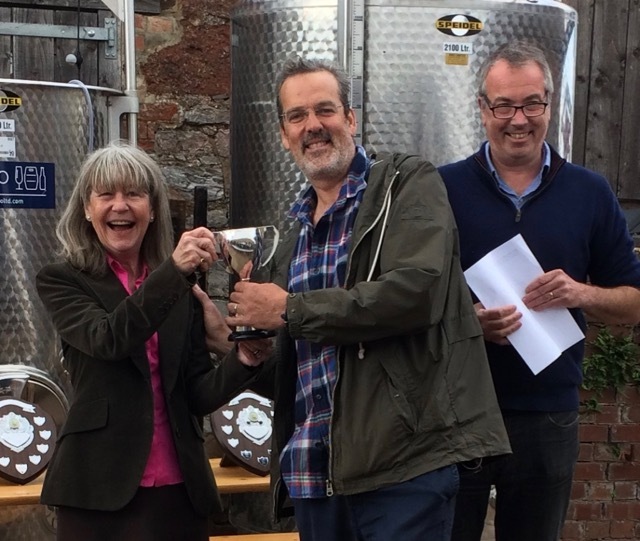 The Wine of the Year is chosen by the SW Vineyards Association competition judges after a taste-off between the winners of each class of the competition. 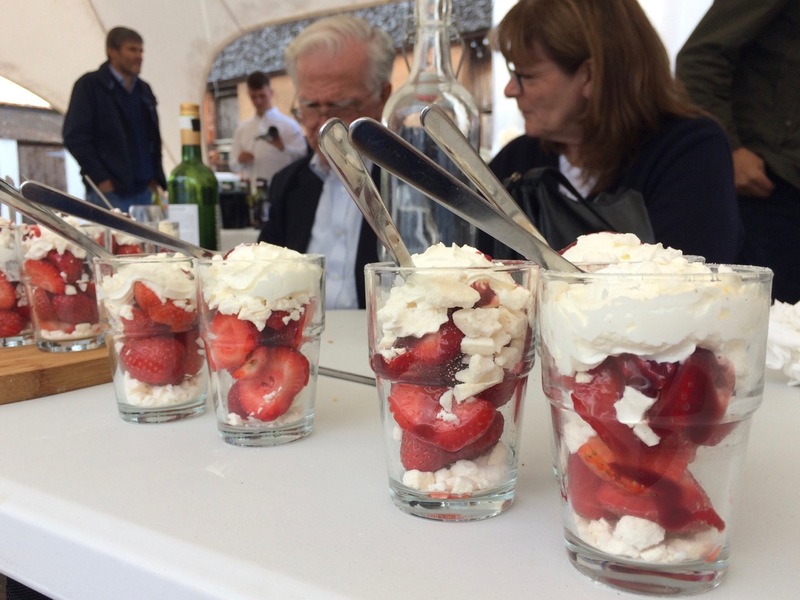 In recent years it has mainly been won by sparkling wines, so for a dessert wine to win is unusual and welcome. 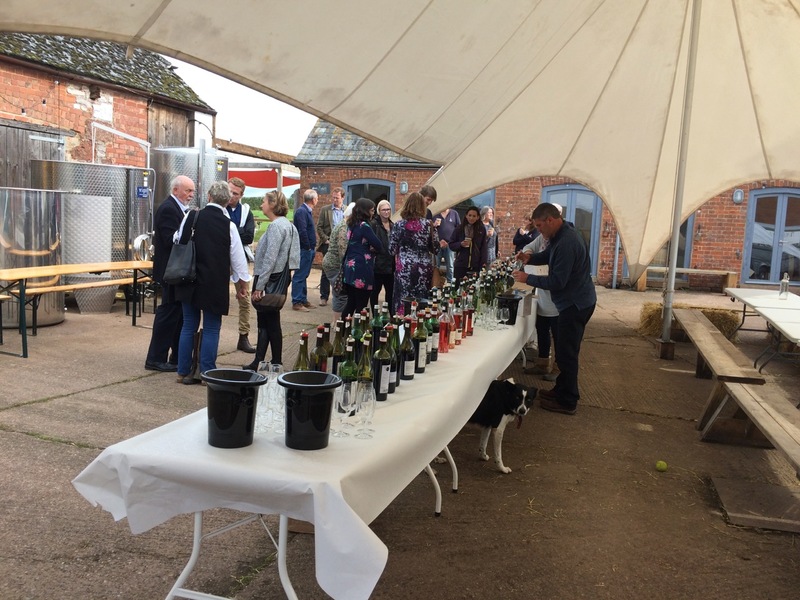 This year the competition was judged by a team of six judges at Devon's Pebblebed Vineyard, at Clyst St George near Exeter, on 11th September. 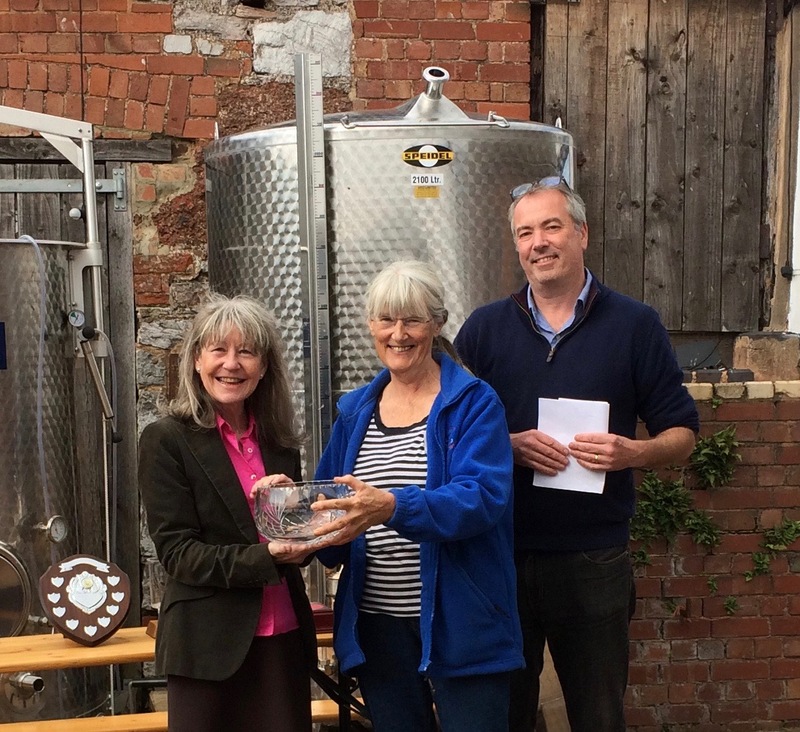 The awards ceremony was the following day at Pebblebed and attended by member vinegrowers and winemakers from across the south west, from Herefordshire to Cornwall. 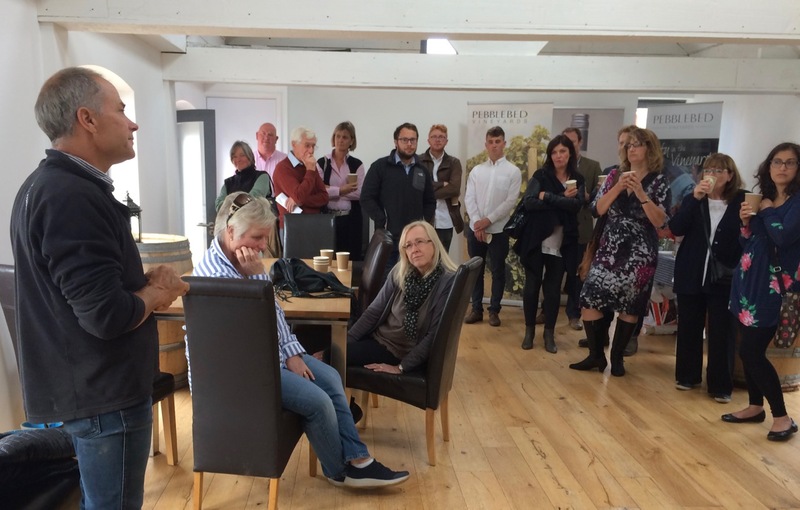 Pebblebed's owner Geoff Bowen welcomed members, explaining that Pebblebed's aims were to be a local vineyard with strong community involvement rather than seeking a national or internationl profile. It is staffed only by Geoff and winemaker Alex Mills and run with the help of volunteers and partners, including those from his BBC "Dragon's Den" appearance. Much of the wine is sold through his wine bar in nearby Exmouth. At harvest they welcome between one and two hundred volunteers. 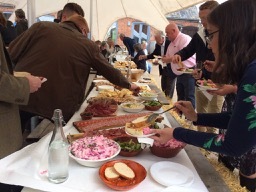 The showery weather was kind on the day and members were able to chat, taste the competition wines, enjoy a delicious salad buffet and listen to the announcement of the competition results out of doors in Pebblebed's courtyard, under the awning. Chief judge Patricia Stefanowicz reviewed the wine classes, commending particularly the sweet whites and white sparkling, the only classes where judges, judging to international standards, had awarded Gold Medals. The judging team of six, Patricia, Alastair Peebles MW, Jemma Mitchell, Lindsay Oram, Tim Johnson and Richard Coulson contained two Masters of Wine and three who regularly judge international competitions. All are qualified to at least WSET Diploma/Educator level. Guy Smith (Smith & Evans) announced the results, starting with the news that Ian Edwards (Furleigh Estate) had decided to stand down as SWVA Chair after three years. Guy, as Vice Chair, thanked Ian for all his work, particularly representing the needs of smaller producers so effectively during the negotiations for the merger of UKVA and English Wine Producers. Guy was later confirmed as Chair by the SWVA committee, who met after the event, with Sandy Luck (Aldwick Court Farm) taking over as Vice Chair. You can see the full results here>> . Wine of the Year was Three Choirs dessert wine "Noble Harvest 2015". Other Golds went to Langham Estates who scooped both of the sparkling wine trophies with "Blanc de Blancs 2014" and "Rosé 2014", to Camel Valley for their "Chardonnay Brut 2014" and to Furleigh Estate for "Blanc de Noirs 2014". 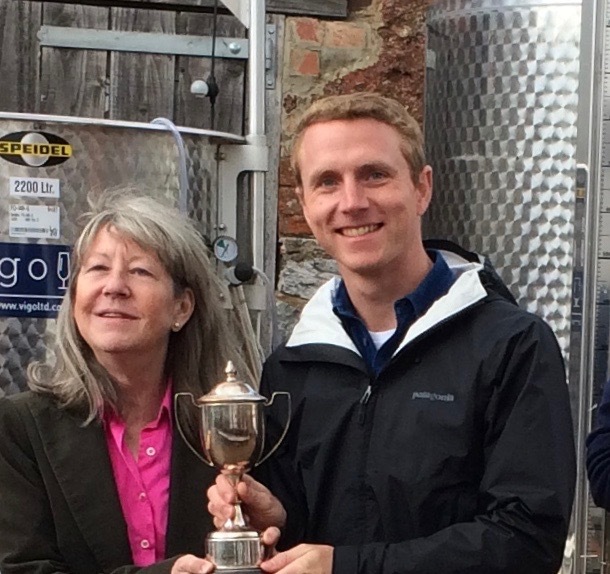 Sharpham Estate also won two trophies, for the Best Dry White and Best Rosé. Best Dry White: Sharpham "Dart Valley Reserve 2016". Winemaker Duncan Schwab. Best Oaked White: Polgoon "Seyval Blanc-Ortega 2015". Winemaker John Coulson. Best Non-Dry White: Three Choirs "Noble Harvest 2015". Winemaker Martin Fowke. 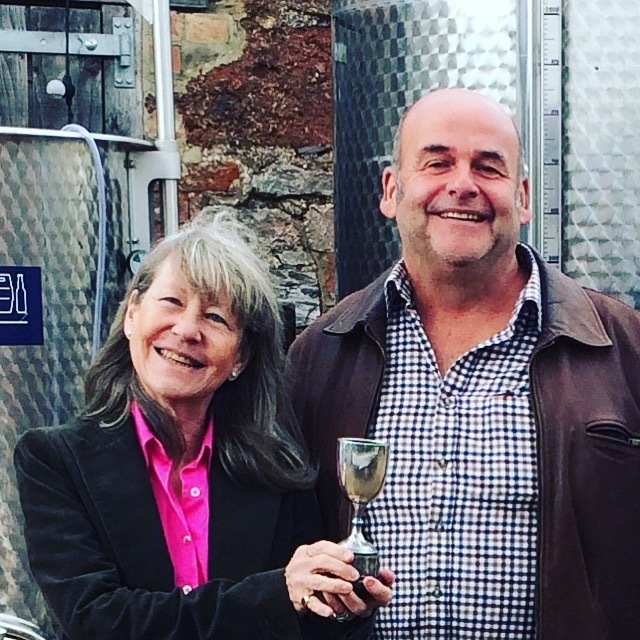 Best Rosé: Sharpham "Whole Berry Rosé 2016". Winemaker Duncan Schwab. Best Sparkling White: Langham Estates "Blanc de Blancs 2014". Winemaker Daniel Ham. Best Sparkling Rosé: Langham Estates Rosé 2014". Winemaker Daniel Ham. Best Non-Commercial Dry White Wine: Claylands "white number one". Winemaker Darryl Gill. Best Small-scale Winemaker: Darryl Gill. The Gillian Pearkes trophy for best contribution to the work of the SWVA went to Jane Awty. 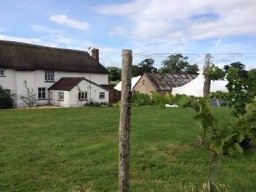 Pictured above (starting top left), Farmhouse at Pebblebed; members gathering in Pebblebed's courtyard; Geoff Bowen's welcome speech in their tasting/function room; buffet lunch under the awning; pudding; SWVA trophies set out for the open-air prize-giving; Sharpham's Duncan Schwab receiving the trophy for Best Dry White from Patricia Stefanowicz, on the right Guy Smith; Polgoon's John Coulson receiving the trophy for the Best Oaked White; Sharpham's young winemakers Tommy Grimshaw and Charlie Brown collecting the trophy for Best Rosé; Langham's winemaker Daniel Ham collecting BOTH fizz trophies; Jane Awty (Oatley) receiving the Gillian Pearkes bowl for services to the SWVA.